We have been excitedly waiting for the latest B&W 800 series for a while now. In due course, a 5.1 array culled from the 15-model strong 800 series arrived, with the newest of the subwoofers and the most gigantic centre enclosure I have probably ever seen. In terms of ranking, this collection sits just below the B&W's Signature Diamond range, where the brand sell tweeters made with – get this – vapour deposited diamonds. 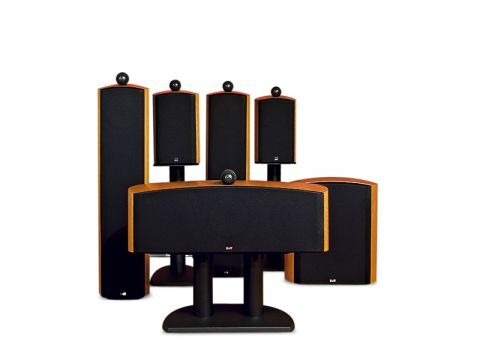 Comprising a pair of floorstanding 804S three-ways with two 805Ss at the rear (a sort of sawn-off version with the same teardrop cross sectional shape and area as the bigger 804S), plus the aforesaid oversized centre, (the HTM3S) and the medium-sized but mighty ASW825 KiloWatt-in-a-box subwoofer, the total cost of the system, including stands, comes to £8,250. Aimed squarely at the high-end enthusiast, this is still, oddly enough, one of those ranges that represents good value for money. The £44,000-per-pair price tag of Bowers & Wilkins' Nautilus loudspeaker almost certainly includes an element of the R&D cost that went into creating them; I suspect the tubery things on top of these 800 series speakers are derived from the tech, but they don't cost nearly as much. Not because they are particularly huge, but because the tweeter tube on the top is very easy to damage; they're also difficult to get a grip on, because they're smooth and rounded. They're weighty, too. The construction quality of these speakers is immense. B&W has to use a big vacuum-lifter on its production line so that normal folk can work on them. Well, it's either that or they'd have to employ audiophile-savvy gorillas. So yes, they are really hard to handle – but as you'll only have do it once it isn't a major problem. But I digress. The 800 series are as beautifully well put together as any speakers I've ever reviewed. If I hadn't got cats, I would always play them grille-free, as they bear an extra B&W badge on their plush woodwork as well as on the grille. In fact the single sole 'improvement' I could conceive of is a move to embedding tiny but strong Neodymium magnets in the speakers and the grilles so they would stay put, but when pulled off would reveal a speaker without ugly grille fixing holes in its face. Each cabinet comes complete with a cute, small microfibre polishing cloth, a set of spike assemblies and a set of rubbery feet (for the towers; spikes under the subwoofer). As each has two sets of the very best speaker wire terminals on the rear, they are also sold with a set of two neatly-soldered plug-terminated wires. These accessories are mounted on plastic blister cards in each carton. A fork on one end and a 4mm plug on the other is used to join the sets of terminals up until you can bi-wire or even bi-amplify them. Interestingly, Bowers & Wilkins recommend bi-wiring wherever possible. In truth, this is an utterly simple system to set up once you have it carefully unpacked. There's none of the cunning supports needed for those extruded aluminium arrays that are so trendy these days, and even the woofer is pretty easy to master. Its controls are limited to just crossover, gain and phase, and a brace of preset EQ offerings, either 'A' or 'B'. The technology employed in the cones of these speakers is unapologetically serious: there's the Rohacell stiffening composite technology; the fact they use Kevlar for their own odd top-surround-less midbass drivers; and those mad tubular-chamber tweeters, descended from the Nautilus. It all adds up to one savage pile of woodwork and acoustic engineering. The performance of these 800 cabinets is what you'd expect – outstanding. This immediately became apparent when I first spun Lyle Lovett's She Makes Me Feel Good from a DTS 5.1 demonstration CD. The system grasped me emotionally in an instant; all my follicles contracted and chills ran down my spine. The 800 series offers sheer, sweet realism and huge dynamics, but with snap and edge and attack. I haven't had anything quite like these in my test room before. This is alongside matching bass speed and melodic grip. Brushes on cymbals could have their bristles counted, while the snare drum struck me in the chest. The layers and nuances came through clearly on recordings I have only ever heard begin to wake up. But these aren't just a hi-fi product – the 800 series is ideally suited for movie surround mixes, too. Blade Runner: The Final Cut (on DVD) features the wonderful Vangelis soundtrack and excellent Foley work. behind it and the glass breaks in the background with a bit of reverberation. Even in the back of the mix, the brittle tinkliness sounds delicious – you can hear the chiming of different sized fragments of glass, as opposed to it being a background 'pish'. The sub's low-end grip, as the final heartbeat throbs, is also impressively heavy but taut. It's just a totally immersive experience, and, along with the crystal clear images on my flatscreen, made for the best cinematic adventure my viewing room has ever witnessed. B&W's 800 series deliver unquestionable sonic excellence, and have thrown down the gauntlet to other high-end speaker brands. They image and articulate like no other. While your bank manager may quibble with their price, your audience will thank you.